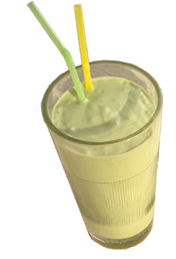 While it is an acquired taste for some, I find a homemade avocado shake delightfully Yummylicious! Blend it all together and serve……whalah! Here’s some nutritional facts about the Good Ole Avocado…. Avocado is a fruit and a tree. It often said to be the most nutritious fruit in the world – and it is. Avocado provides more than 25 essential nutrients such as protein, potassium, vitamin E, C, B-vitamins, folic acid, iron, copper, phosphorus and magnesium, just to name a few. Avocado also provides calories for energy and beneficial phytochemicals such as beta-sitosterol, glutathione and lutein. Overall, avocado is considered a complete food. With vitamins, minerals, antioxidants, calories and fiber with no cholesterol and is sodium free. Avocado is ideal for growing up children, adults and even for babies, especially when blended with other fruits. For athletes, avocado is a nutritious energy booster to rev up the body’s strength. Ha ha, but it’s not exactly cheap when purchased outside right? I mean it is $4.20 near my office. 2.50 at hawker stall. They use brown sugar / gula melaka. Yummy!!! out there shud try it out. Whoah! Haven’t heard from you in a long while..Welcome mate! 🙂 erm..but but…With chocolate sauce? Is Super fattening..yikes!